With V-Day right around the corner, we have the perfect antidote for the traditional Valentine's a lot of us are allergic to. 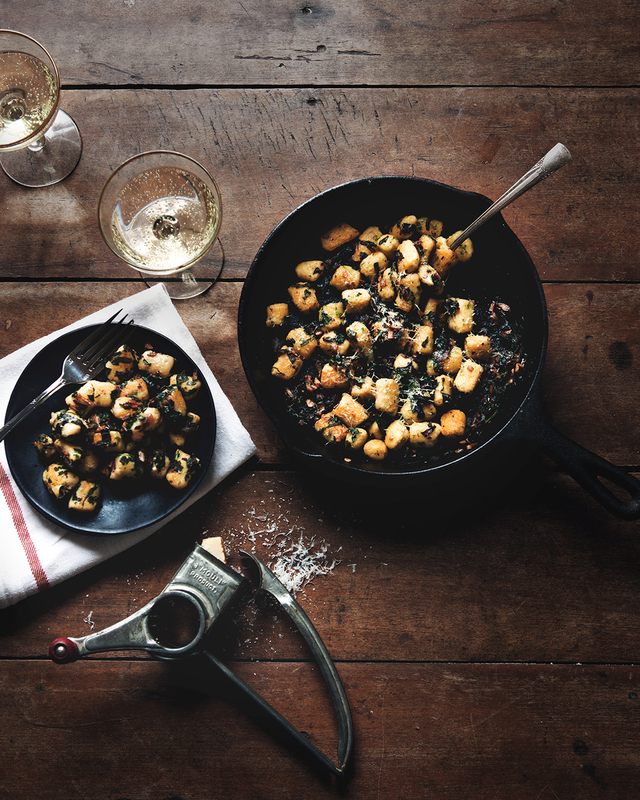 Homemade Parisian gnocchi, served in a skillet that you can put right on the table, share a bottle of wine and there you have it. It just sounds romantic right? It is. If you look around the internet there are tons of articles, seemingly in two categories. One is very, "in defense of Valentine's Day" (I'm talking about you GQ, this is actually super sweet) while the other's are rounding up the best memes for singledom. I'm not against being extra cute and lovey with your partner on Valentine's, going out somewhere special or extra fancy. But there is something to be said for being at home, with one or both of you taking the time to make a meal, share a meal and just be together. Now this could still be stemming from my allergy to dining at a restaurant, filled only with couples with a single rose on each table. It could also be stemming from the fact that It's romantic for me to just be together. Whether we're at our favorite bar on the corner or out somewhere I know the bill will be outrageous. With all critique and expectation aside, I can get down with the excuse to have an extra special dinner, just because, on February 14th. Bring water, 8 tablespoons butter, and a pinch of salt to boil in a medium saucepan over high heat. When boiling, add flour and stir very vigorously with a spoon until a smooth dough forms. Reduce heat to low and continue to vigorously stir rapidly, making sure the dough is not sticking to the pot. Continue cooking and stirring until dough steams slightly. Transfer the hot dough to a stand mixer. Add cheese and beat on medium-low speed. When cheese is fully incorporated, add eggs, one at a time making sure each is fully incorporated before adding the next. When all eggs are mixed in, add herbs and mix to combine. Transfer to a pastry bag fitted with a 0.5 inch tip and let mixture rest for 20 minutes at rom temperature. While resting, bring a large pot of well salted water to a low boil. Holding the pastry bag close to the water, squeeze out dough and using a small knife, cut 1’’ lengths into the water. Squeeze and cut as many as you can in 1 minute and stop. Gnocchi will float to the top - when they do, continue to cook through, about 3-4 minutes longer. Test one but cutting in half and making sure inner dough is cooked through. When they are done, use a mesh trainer to transfer to a baking sheet. Continue cooking in batches until all dough is used. Set gnocchi aside to cool. On a large cutting board, stack leaves of swiss chard and roll tightly into a long cigar shape. Using a sharp knife, slice perpendicular to the roll to create thin wheels of chard. Coarsely chop wheels of chard into fine shards. In a cast iron skillet over medium high heat, melt 1 tbs butter until bubbling. Add shallots, mushrooms and chard, season generously with salt and pepper and cook, stirring until shallots are translucent and chard is wilted, about 5 minutes. Remove from skillet and set aside. In the same skillet over medium high heat, melt additional 1 tbs of butter until bubbling and starts to brown. When melted, swirl to coat pan and add gnocchi in a single layer. Cook, undisturbed for about 4 minutes. Check gnocchi to see if browned on bottom, when they have browned, toss and cook an additional 2 minutes. Add chard, mushroom and shallot mixture and toss to combine, cooking an additional 2 minutes. To serve, top with freshly grated parmesan cheese.